From the publishers of Dice Hospital – Alley Cat Games – we welcome you to visit our much larger stand at 1-B6! We will be demoing production copies of Dice Hospital. Dice Hospital is a light-medium weight worker placement and dice manipulation game, where the dice are your patients! 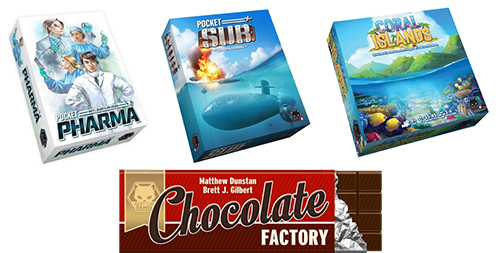 We will also be demoing pre-production copies of Pocket Pharma and Pocket Sub and prototypes of Chocolate Factory, (a medium weight game with a production line and wooden chocolates!) Coral Islands (a light dice stacking game) and Ali Baba’s Gems (a light bluffing game featuring diamonds). There is also a good chance we will be able to sell copies of Dice Hospital and give backers their copies!